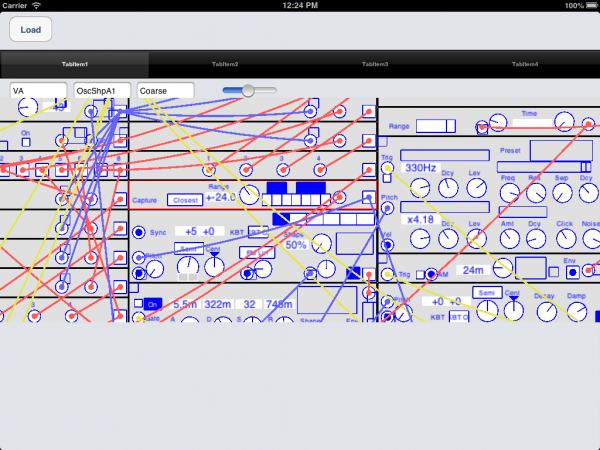 IOS Apps do control synths with old fashioned midi, like the brilliant Step Sequencer ST-S01 by SchoSoft. Not sure about usb-midi. Would serial midi be OK? So, looks like Apple closed that interface for commercial reasons. That leaves Midi or Wifi. With Midi you could set up a limited communication. You can send patches using sysex and cc messages. With Wifi you need to connect to some computer that has the actual usb connection with the G2. I implemented both these things in the os editor, so that should be possible but far from ideal. I doubt it will ever be possible to directly connect an Ipad to a G2, unless Apple changes there policy about the usb interface. Don't know yet but maybe an Android tablet or Windows Surface. Thanks for the research, seems like Apple don't want anyone accessing USB. 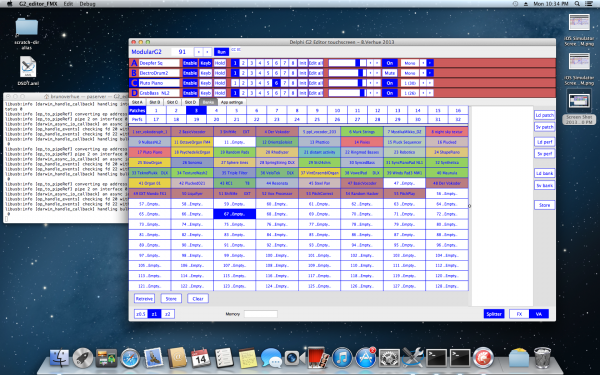 If you want to compile for midi I can test midi over wifi. But it does sound limited without realtime patching. Also, I don't know how you can distribute it without the Apple store. Would be interesting to see how feasible it is to patching cables on a tablet. I hope to try it on a Windows surface Pro tablet, since many of them have stylus as well as finger touch options, and it should work without any changes necessary. I'll be interested to hear if it works on a surface tablet. But personally I think the user interface has to be redesigned for use on a tablet. Maybe there are some tablet applications already that have a similar complex user interface from which we could get some ideas. In case of the IPad, I think wireless is the way to go. One option could be, as someone suggested on this thread earlier, to have a raspberry running on linux connected to the g2, which could run a g2-usb-network-server process, and the ipad as a network client. If I understand correctly, lets you have the usb-protocoll over wireless, which maybe could bypass Apples restrictions on the USB port. Ok, got a big part of the code to run in the iPad simulator. 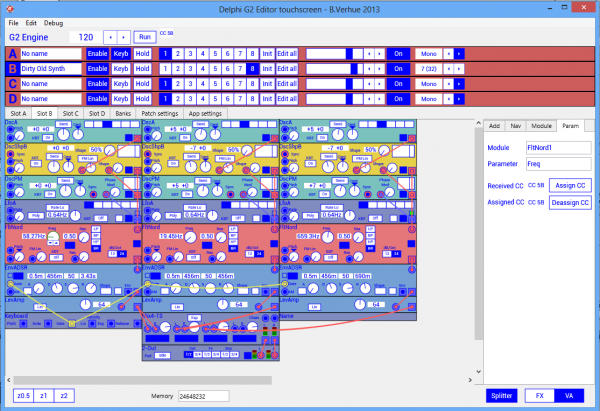 I can load a patch, display it and do a bit of zooming. Seems network is available also but haven't tested it yet. The graphics are quite ugly, I hope this has something to do with the simulator. The fonts don't seem to scale properly. And it is slow! as expected. A idea struck me, which is very useful.. Dont want to bother you with it, but if you feel like you can make it and have the energy for it and you are going to have fun making it.. Would be so powerfull, and i think many will greatly appreciate it.. The function "Exclude From Mutation" , but instead "Exclude Parameter From Mutation".. Would be much more effective..
Great work! It looks "early Ableton". This is big news! I had kind of given up hope a bit of longer term development because your original editor was in Pascal (which I thought would make porting very difficult). The graphics are not beautiful but they are not awful either. I am definitely OK with them being a bit 'simple' if it makes performance better. I say it is big news because lots of people have iPads now, and I think many would be willing to pay for a working G2 editor app. I have been debating whether or not to buy an iPad for a while (as I am mostly hardware anyway, and don't even use a DAW much), but if you get this working then that would be a 'no question' decision for me. In fact, just before reading this post I was wondering if I would need to buy a Surface or if I should just dedicate an old laptop to running the G2 editors. Would it ever be possible to build 'compound' modules that are simply containers for other modules in the editor (like the G2 building blocks)? That is, nothing is changed on the G2 itself, but some nesting is possible in the Editor. In theory it could be done to build an ipad g2 editor, but there's still a lot that has to be done. In theory it should be possible to make one for android also, because the new Delphi compiler a have can build applciations for windows, osx, ios and android, from the same base code. I've tested a bit more with the ios compilation and I was able to make a network connection to a g2-server program on my windows machine from the ipad simulator and load patches/change parameters etc. Biggest problem is the performance, network communication is not fast enough for all the led and volume messages that are exchanged and graphics rendering is slow, then you have to realize that on the ipad itself it will perform even slower, so a lot of optimizations are needed. The graphics are ugly because on the ios simulator there is no anti aliasing. So because there is a "proof of concept", I would like to think about the user interface of a g2-touch-screen editor first, wether it's a iOS/Android or Windows surface application can be decided later on. I've made a concept application, to try some things out. It's not finished of course, you can see it in the screenshot. The goal is to be able to make patches on a relatively small screen with your fingers. So on top I would like to leave the four slotstrips with the slot functions that are used the most, like patch volume, variation selection and so on. On the bottom left you can select a zoom setting. I think you need about 3. One zoom to get an overall view of the patch, one to zoom in on a module and one 1:1 view. On the bottom right you can select the patch location. I think the horizontal bar which devides VA/FX in the original editor doesn't work on a small touch-screen so with these buttons you can set the main window on VA or FX or Patch settins. Then on the right side you have a multi-functional panel. Can be used to load patches, add modules, set parameters and so on. One important function in this panel is Module-Navigate. It will show a list of all the modules, sorted by column/row. So you can easily scroll through the list an when you tap a module the main window will focus on this module. So that are some ideas I'm working on. About your question about compound modules, the problem with those is that its not possible to store the settings for a compound control in a Patch. The patch file cannot be extended because that would alse need a change in the G2 firmware. I've watched the video of the g1 and g2 edtors on the windows surface tablet. That made me think about some things. It would definitely be an improvement if you can zoom in on the patch, al the knobs should be made bigger. Another thing that doesn't seem to work on a touch screen is dragging cables. What I think that I'll do to try and make an interface in which as much tasks as possible can be done by max two finger points on the screen. In the first finger pointing action you select an object, and depending on the object the inerface goes into a certain mode. For example you point to a connector and the interface goes into cable drawing mode. The scond finger pointing action results in a change depending on the current operating mode. So if it's into cable drawing mode and you point to another connector, a cable is created. You see an example in the screen shots. In "G2Touchscreen2" I've made some patch and I point to connector BP on Fltmulti1. The result you see on screenshot "G2Touchscreen3", a small yellow rectangle opens up, indicating that you are in cable drawing mode. The rectangle has three buttons, on the left you see "sv8-11", "OscshpB1". These are the existing cables on connector BP. If my second point is on one of these buttons, the corresponding cable is deleted. Or if my second point is on button "Cancel", that would cancel cable drawing mode. Or my second point is on any other connector in the patch, that would create a cable from the first pointed at connector to the second. Very happy to see you are still working on this. I check in now and again to see what progress is being made. Funny because watching the videos you mentioned above is what made me think to check in today. Anyway, I think a touch enabled app is an excellent idea. I can imagine a touch screen placed above the G2 keyboard being a very satisfying experience, removing the disconnect between the software editor and the G2 hardware. I got the new editor working on the hakintosch though, without too much effort! 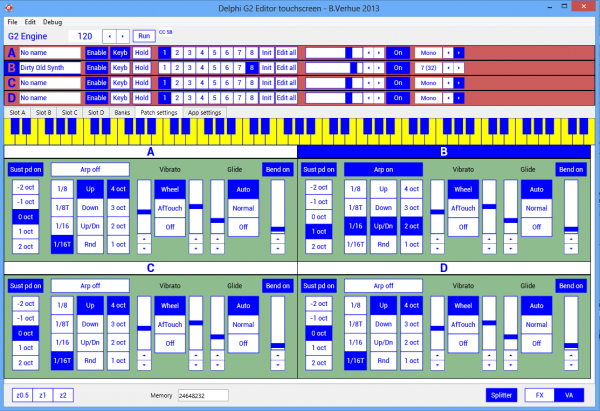 Personally I think the Delphi people did a good job, making a multi platform compiler. They go a lot of critisim but and it took a couple of versions, but now it seems to work. I'm using libsub-1.0.8 on Mountain lion. Here are some screenshots, the only thing is that the applications don't look the same on different platforms. Because I mainly develop on Windows, that version look a bit better now. The second screenshot is the "patch manager" I'm working on. I think I will set up an internet page so everyone who is interested can test the application and maybe participate with making some of the graphics. Wow! 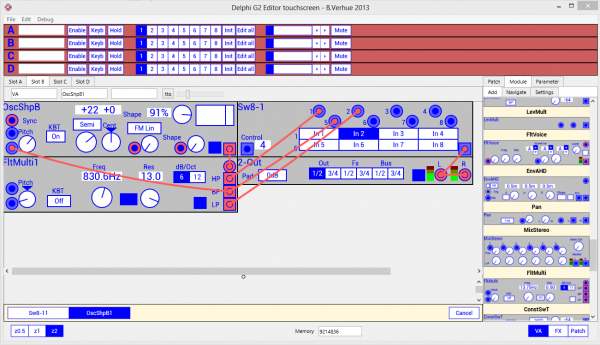 I hadn’t checked this forum for a while but development of a touchpad based editor would be BIG! I’d vote Ipad as I have one and probably most others do but I’m biased. I’d also be willing to pay quite a sum for an editor. 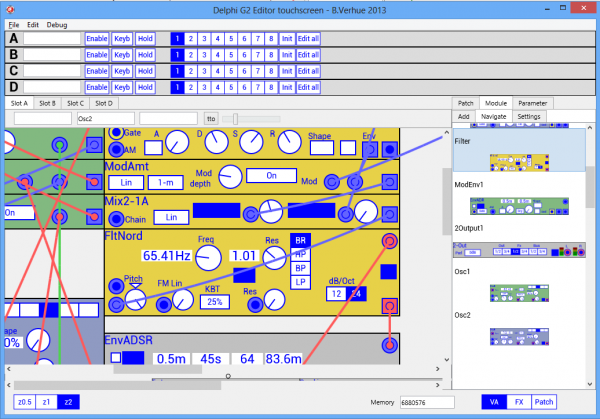 Your two finger operation patching sounds great – and I think graphics look ok! The problem with the ipad at the moment is that we are not allowed by apple to use the usb connector. At least that is what I found searching for examples on the internet. There is a developement to enable usb protocol over wifi, that might be a solution, but we would have to wait until its ready, and then we would have to figure out how to use it. Meanwhile here are some more screenshots. I've made a sidewindow to connect a midi controller to a parameter. 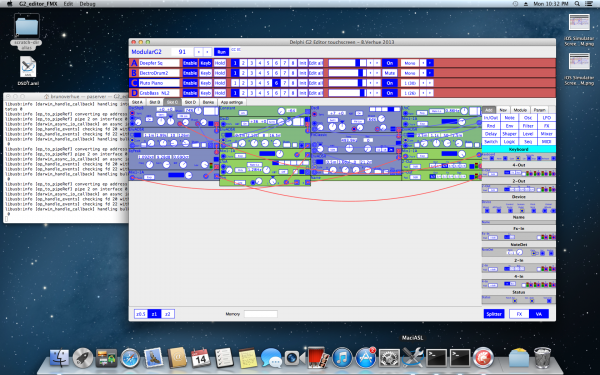 That is the midi-learning functionality. All the parameter settings will be on that side panel and I will make a side panel for module settings too. On the scond, there are the patch settings for all four slots in one window. With the keyboard you will be able to set the split keyboard range for a slot. So really a lot of controls in this window. I'll be busy with some other things next week but hopefully I will get a prototype ready in a month or so. Ah, yes you are right. That may be possible. Hadn 't thought of that. You would have to think of a format to store the patch data in the notes, and some code to read/write from it. Think it would be quite some work to make it, but possible. Great idea. I love the way Quartz Composer works where you can double click a macro patch to edit the contents and then a blank space to go back up one level. I guess Reaktor works the same. I'm looking at these screen shots and thinking, if this was a standalone app with full audio (like the G2 demo), rather than an editor, it would be the best app ever to be released on the iPad. Hi, Brunov! Impressed of your work! Using it with two instances of G2m on pc and it is really great! Waiting for android devices release! that actually was the remark that got me going on my new hobby ... my first save is from the date this was posted ... nothing like a G2, and no plans to make a G2 either, it just looks a bit like it as I like the interface, just wanted to toy a bit with with my own sound algorithms. To get G2 like sounds .. long way to go I'd think to figure out the algorithms they used. The module_defs and module_implementations pas files might give some ideas for creating a G2 emulations. My code has no anti aliasing whatsoever, Clavia uses some, what i hear sounds like they use filtering, not an avoiding algorithm. There will be some limits as to what an iThingie can do with modulars ... modulars really need to be evaluated sample by sample I think, which is less efficient than block processing ... needed tho for patches with feedback to short roundtrip delays for signals. edit : ah no, not the model .. the interactions .. the model is the theory. this is really impressive! Amazing you made this in such a short time. I'm listening to your noodle recording right now. I'm close to releasing a first beta of the new g2 editor. 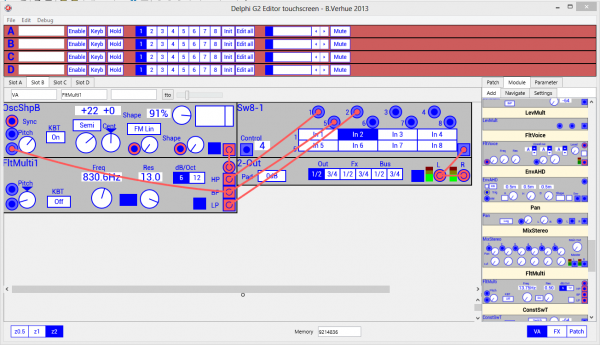 Maybe the gui part of the editor might be useful for your project also. How do the LEDs on the output modules work? Are they responding to feedback from the synth? If so, would it be possible to create an oscilloscope module, or add an oscilloscope to the output module?